That Moz Guy on Does Earth have a natural prime meridian? Duncan Steel on Does Earth have a natural prime meridian? 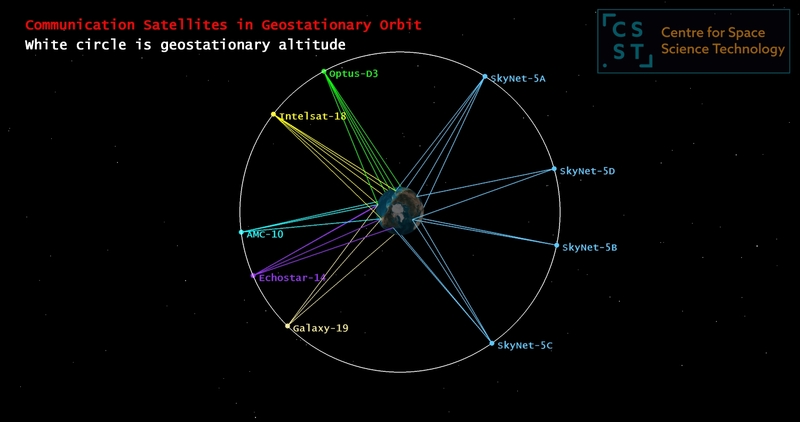 What sorts of orbits around Earth do we use for different types of satellite, and why are those paths chosen? 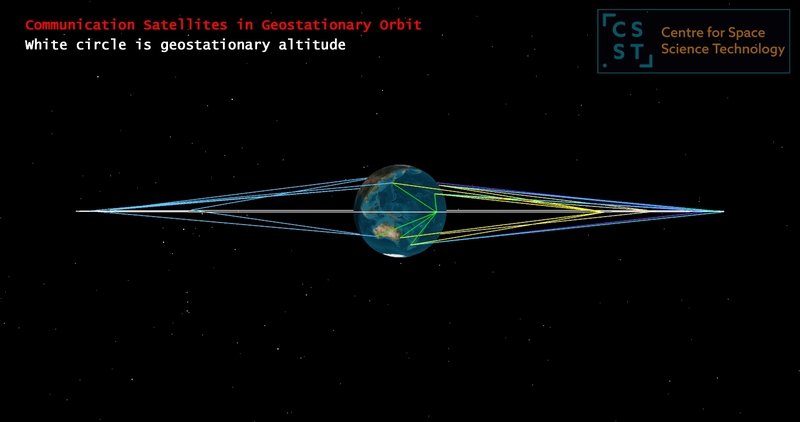 In this, Part 1 in a series of blog posts, geostationary orbits are described. Satellites come in all sorts of shapes and sizes, ranging from half the size of a bus down to something not much bigger than your mobile phone. Indeed if one counts the International Space Station as being a satellite – as we surely must – objects constructed in orbit can be larger still. 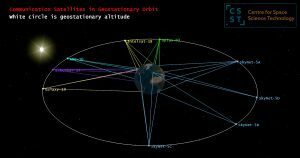 My intent in this series of blogs is to describe different types of satellite orbit around Earth (geocentric orbits), and the uses to which they are put. It’s all quite simple, and I hope that educators might find the series (and in particular the graphics and movies) useful. I’ll start with the larger orbits and then come down to those closer to our planet’s surface, skimming just above the atmosphere, before discussing in later posts some peculiar satellite orbits used for specific applications. Some of the biggest satellites sent aloft in single launches are those intended for the furthest orbits. 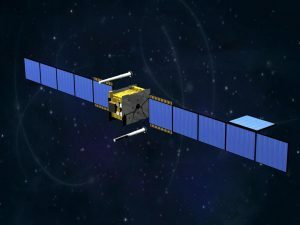 Although a few are smaller, most of these satellites have masses of a few tonnes, are about the size of a large car or minivan, and they are intended for one important altitude: about 35,800 km above Earth’s surface. At that height they take precisely a day (though not 24 hours) to circuit our planet, and so such orbits are termed geosynchronous. Why do I say “not 24 hours”? This is a matter that confuses many people. If they are asked “How long does it take Earth to spin once on its axis?” most will reply “24 hours”, but actually the time taken is a little less than that. The interval of 24 hours is the mean solar day, the average time for the Sun to return to more-or-less the same position in the sky; ‘average’ because it varies across the year due to the non-circularity of our orbit around the Sun and therefore Earth’s varying speed in space, and also the tilt of our spin axis compared to our orbital plane. For the Sun to come back to the noon meridian requires Earth to have spun by slightly more than a full 360 degrees, because we have moved along a little in our orbit. Let’s assume that a year lasts for 365.25 days (although in reality I could list and describe at least ten distinct technical ways of defining a ‘year’, each with slightly different durations). In that time our planet completes a full orbit around the Sun, and so it has spun on its axis an extra turn, making 366.25 turns in all. The length of time taken to spin once is therefore 365.25/366.25 mean solar days: almost four minutes short of the full 24 hours. This interval of 23 hours, 56 minutes and about 4 seconds is called a sidereal day (i.e. a day according to the stars rather than the Sun). This is the period required for a geosynchronous orbit, not 24 hours. 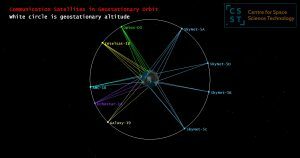 To have an orbital path that results in a satellite staying above one particular point on Earth’s surface – a geostationary orbit – requires further constraints to be obeyed, not just a geosynchronous orbit. 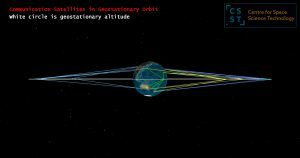 A geostationary orbit is circular, and directly above the equator. 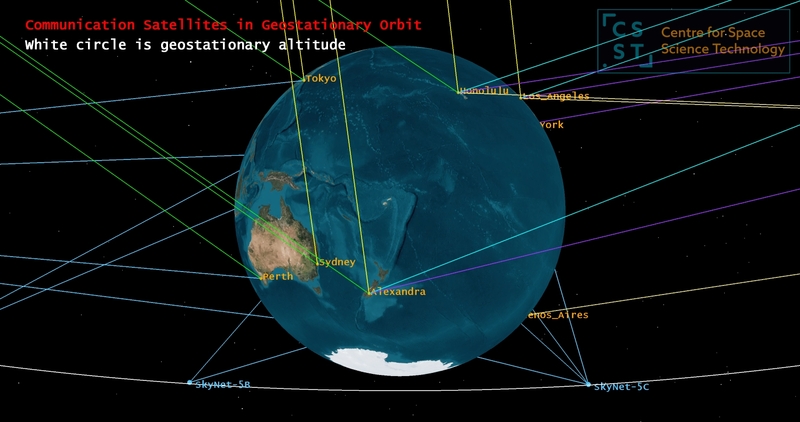 In terms of orbital parameters we say it has zero eccentricity and zero inclination. Above: Communication satellites in geostationary orbit, about 35,800 km above the equator. download (50 MB) as a WMV file here, or as an MP4 file here. Naïvely one might imagine that if you placed a satellite in such an orbit then it would stay there, but various perturbations (mainly due to the gravitational tugs imposed by the Moon and the Sun) will cause it to wander. From the perspective of a satellite dish down on Earth’s surface, if the eccentricity becomes non-zero then the satellite will shift back and forth in the east-west direction across each day; if the inclination becomes non-zero then the satellite’s position will oscillate north-south. Should either the eccentricity or the inclination become too large then the satellite will move outside of the beam covered by that dish down on the ground, and the signal linking the two will be lost. To counteract this natural and inevitable wandering by the satellite it is necessary to conduct station-keeping manoeuvres, using small thrusters. 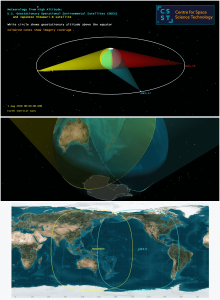 It may also be that the pointing of the satellite’s antenna will shift away from the desired direction (i.e. earthward), due to various influences; for example sunlight striking the asymmetric satellite will impose a small torque, rotating it away from its needed orientation. To compensate for this, thrusters are required, generally located on the corners of the satellite. Similarly the satellite may have a solar cell array spread sideways that needs to be decoupled from its once-per-orbit spin and maintained perpendicular to the direction of the Sun, although other satellites simply have solar cells wrapped right around their exterior. These thrusters – or, more significantly, the necessary fuel for them – are one reason that satellites sent into geostationary orbit tend to have large masses. Once the fuel is exhausted, control of the satellite will gradually be lost. The cost of building and launching a geostationary satellite may be upwards of a billion dollars, and they are generally planned to operate for at least fifteen years. That means a lot of thruster fuel (typically hydrazine) is required. At left: An artist’s impression of one of the Skynet-5 satellites when deployed in geostationary orbit. 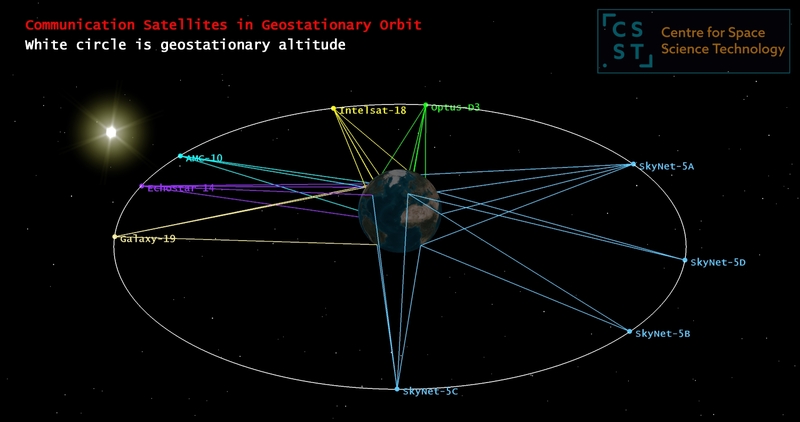 Geostationary orbits are most commonly used for satellites delivering communications services. When we had only copper wires under the oceans carrying intercontinental phone calls, those calls were expensive. Once geostationary satellites could be used, such calls became cheaper but the time delay (the interval for the signal to travel up to the satellite and then back down again – at least a quarter of a second) tended to be annoying when you were trying to hold a discussion. Nowadays optical fibres carry our phone conversations across the ocean floors, making the calls even cheaper and faster. 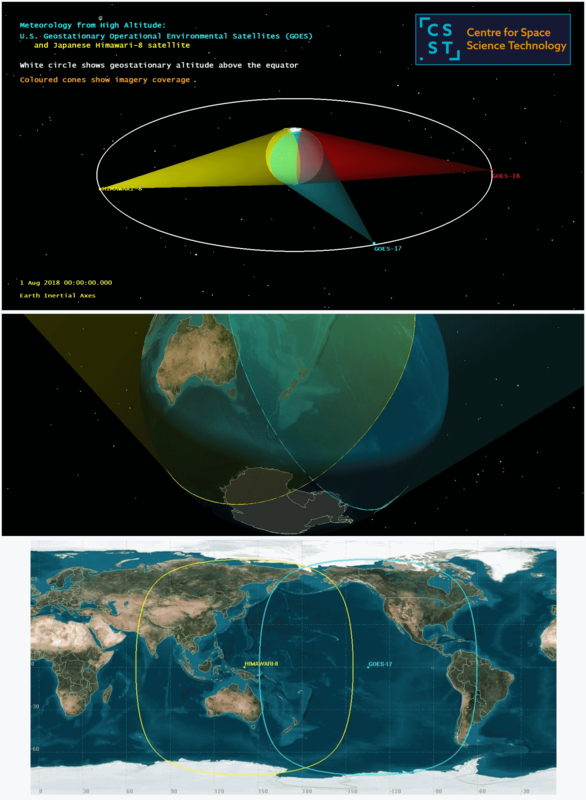 Geostationary satellites are used for other types of communications, however, transmitting television and other signals around the globe. Another use of geostationary satellites is in imaging the planet below. A major application of cameras and other instruments on board such satellites is in meteorology, for which high spatial resolution is not needed: they can cover most of a hemisphere, but with pixel sizes limited to about 1 km on the ground. Above: the geostationary orbits of two U.S. meteorological satellites, GOES-16 and GOES-17, and also the Japanese Himawari-8 satellite. The coloured cones indicate the almost-hemispherical coverage of their cameras. The lower frames show how the overlapping coverage of GOES-17 and Himawari-8 includes NZ. GOES images can be viewed here; Himawari-8 images are available here. I started this blog post a little bit deviously, in that my subject matter has clearly been restricted to artificial satellites, whereas previous to the advent of the Space Age sixty years ago the word ‘satellite’ was applied to natural orbiters of the planets: the Moon is a natural satellite of the Earth, and the Galilean moons are natural satellites of Jupiter, just as the rings are natural satellites of Saturn. All that has happened in English is that a qualifier has been added in front of ‘satellite’. In te reo Māori two terms seem to have been introduced to describe an artificial satellite: amiorangi and waka tawhio. Both trip rather lightly off the tongue. I’d suggest they merit consideration when New Zealand builds and launches its first satellite so as to beam back data from out of space. This blog series about satellites is intended to be rudimentary in nature and hopefully of educational use. Feel free to link from your own webpages, and make use of the graphics/movies. Nice Information. There is no doubt that these artificial satellites are a huge technological and scientific advancement of the human being. But, could you tell how many satellites orbit the Earth? Essentially, your question is impossible to answer in any definitive way. Any answer must depend upon what one defines to be a ‘satellite’. The Moon is a satellite of Earth: do we count it here? I think not, in that we are clearly talking about artificial satellites only. So, do we count the tiniest piece of debris (such as a paint fleck) that has been launched into orbit as part of some larger object? Do we count the upper rocket stages left in orbit, despite them having no ongoing function? In view of these considerations, about all one can say in answer is “a lot”. Tens of thousands, at least, in terms of what has been tracked at some stage; and although items around 10 cm in size might have been tracked in low-Earth orbit, there are others of the same size but at higher altitudes which will have escaped detection and tracking. Duncan Steel is based in Nelson but works for the Xerra Earth Observation Institute with its HQ in Alexandra. He has worked in space research for almost forty years, with times spent with NASA, ESA, various universities and observatories, and also running his own company. Duncan is the author of four books, over a hundred research papers, and more than a thousand articles for newspapers and magazines. He has also appeared in hundreds of radio and TV programmes. Minor planet/asteroid (4713) Steel is named for him, as is a lunar-roving robot in one of Arthur C. Clarke's SciFi novels. Erik Vermaat on Does Earth have a natural prime meridian?